The authors find a long-term elasticity of income with respect to tax rates of 0.72 for earners in the top 0.1%, “suggesting a high degree of responsiveness to incentives for income-earning efforts  among those with the highest incomes.” In other words, when tax rates go up, super high earners earn less and deadweight losses are large. 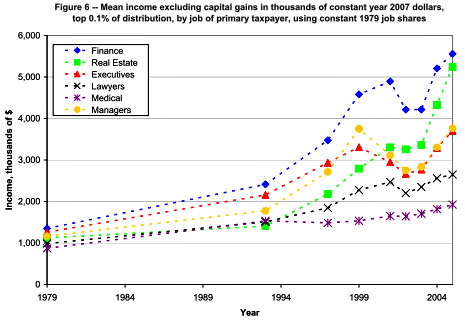 However, elasticity for earners in the top 1% is -0.34. In other words, merely moving down from the top 0.1% to the top 1% apparently changes your responsiveness to tax incentives from +0.72 to -0.34. That’s an extremely dramatic result and should make us very suspicious. would have no effect on society at large. Would they get lazy and drive their companies into a ditch, therefore lowering their bonuses? That hardly seems likely either. The problem here is twofold. First, the calculation of elasticity is obviously very sensitive to the parameters of the model you use. Second, it’s very difficult to conceive of an actual mechanism in which higher taxes on top earners translates into lower work performance and therefore deadweight loss to society. My guess is that super high earners respond to tax increases mainly via accounting strategies, not work effort, and in any case, any reduction in their earnings simply ends up going somewhere else anyway. In fact, if you take the original model in this paper seriously, an increase in high marginal tax rates reduces the earnings of the 99.9th percentile but increases the earnings of the 99.0-99.9th percentile. In other words, the total earnings of the top 1% probably go up on net. The real income growth rate for non-financial executives in the top 0.1 percent was 7 times as large as for non-financial executives in the 99th to 99.5th percentile range….The heterogeneity in income growth rates across professions within the top one percent, and the divergence in incomes within professions in the top one percent, both suggest that the causes of rising top income shares cannot just, or even primarily, be things that are changing in similar ways over time for everyone within the top one percent, such as federal marginal income tax rates. According to the authors, skill-biased technical change and globalization are unlikely candidates too, and the superstar effect is too small to have a significant impact. It has to be something else. Something that’s driving enormous changes not just at the top, but at the very tippy top. The financialization of the U.S. economy, along with changes in norms of corporate governance, seem like the best guesses to me. Anybody got a better one?